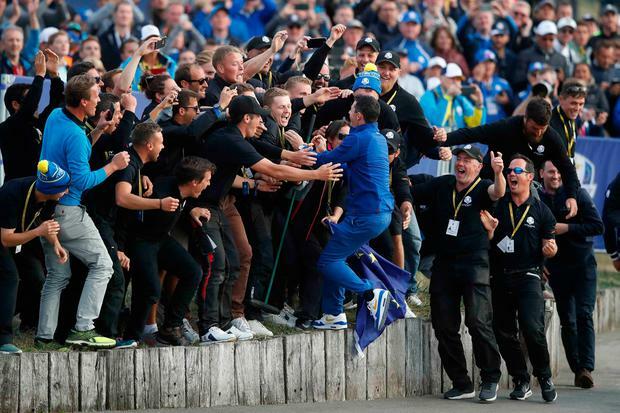 Pádraig Harrington dodged the champagne fight on the putting green with a grin as wide as the faux Whistling Straits 'links' that will host the 2020 Ryder Cup. He's the red-hot favourite to captain Europe at the Irish Course in Wisconsin in two years' time, but for now he's content to draw huge satisfaction, not from the humiliation of friends like Jim Furyk or Phil Mickelson, but from seeing a well-hatched plan carried out to perfection. It could be argued that Europe didn't just win the Ryder Cup on the fairways of Le Golf National but a few weeks ago when Thomas Bjorn named Sergio Garcia, Henrik Stenson, Paul Casey and Ian Poulter as the wildcards he needed to turn a good team into an immensely strong and versatile one. With such a strong hand, it was a question of Bjorn playing his cards right and Harrington was pleased to play his role in that process as Europe ran out convincing winners, not for personal glory but for his close friend Bjorn - with the wild-card picks contributing 9ƒ of Europe's 17ƒ points. "I wanted to win this one big time," a back-pedalling Harrington said as he watched Tyrrell Hatton chased around the green by a team-mate wielding a magnum of champagne. "I knew this was a big deal for Thomas and how big it was. This is a tough job. You just don't want to be a losing captain, because you get thrown under the bus if you are." Furyk's decision to play Mickelson in foursomes on Friday afternoon and leave US Open and US PGA winner Brooks Koepka on the bench was a key moment and one Harrington felt was an example of the Americans overplaying their hand with a team that was strong on paper but lacking the tactical options Bjorn had. "The US seemed to play their cards very early and left themselves vulnerable on Friday afternoon, and we won that series 4-0," he said. "I don't know they had that many options. "When the fourballs came out, not to have Phil Mickelson in the fourball, you're wondering if he's sitting out all day or playing. "Surely he's a fourball player. They just didn't have the options we had. Sitting out Brooks Kopeka having won two Majors and probably the player of the year, things like that." Harrington felt Europe simply had a more balanced team, exemplified by the luxury of reserving Stenson for the foursomes only. "Maybe our picks were the pivotal thing," he said. "They probably tipped the balance for us and probably for the US as well." What satisfied Harrington was how the picks created a cohesive, adaptable unit that crushed the Americans, slowly but surely, with five strong vice-captains ready to help Bjorn decide how best to deploy his troops at the key moments. He was shocked at the criticism Bjorn received for naming Garcia among the wildcards. But he had no doubts about the decision. "The picks were hugely important," he said. "They brought a lot of balance to our team. We were astounded by people's lack of insight into how you pick a person to add to your team. 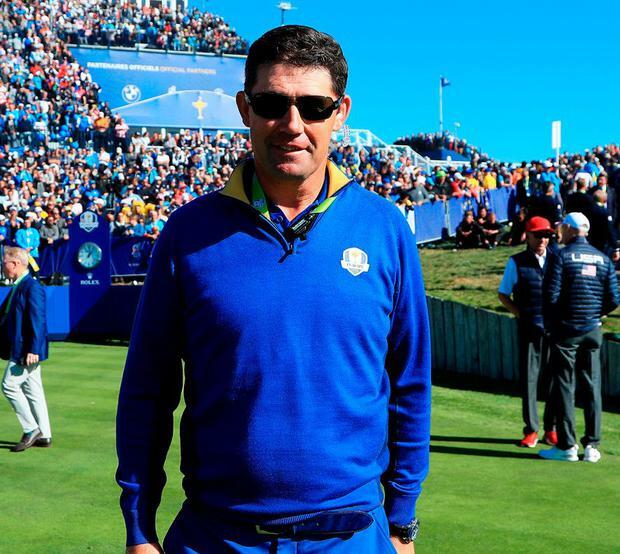 "We knew what Sergio does in the team room, his versatility for playing foursomes and fourballs, his versatility for adding to a partnership for bringing a rookie on, or as he did with Rory, raising someone's spirits. "He's the record points scorer now. And he's there for a reason. And with Poulter it was the same. "So we had a very good team. A team that for once we had no weakness. We had a great balance in the team - a mix of good foursomes and good fourball players. We weren't hiding anybody." He was pleased for the skipper - "This defines Thomas Bjorn's career" - and it seems inevitable now that Harrington will be invited to captain the side. "I always said we'd talk about the next captaincy after this Ryder Cup and this one hasn't finished," he said. "We still have a night to go. All this talk about what's happening going forward, it's for another day." Pressed for an answer, he added: "I'd love to be a Ryder Cup captain. I'd love to bring my thoughts to the game. "But it's an interesting one because I wouldn't do it without a certain amount of trepidation because it's not easy. "It's a tough, tough job what goes on. Unfortunately, the captain gets judged on results rather than anything else. I wouldn't go into it lightly, but on balance, yes I want to be a Ryder Cup captain." Graeme McDowell believes that Harrington or Lee Westwood are the next two natural captains for Europe and he sees the Dubliner as a man he'd love to serve under if he fails to make the team again as a player. "Padraig was very good," McDowell said. "He sees all the angles. He's calculating. He has that analytical brain that dots all the i's and crosses all the t's. I'd love to help him out."